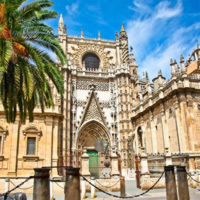 Seville`s parish churches display a fascinating variety of architectural styles. Several are converted mosques with belfries built over their minarets, others range through Mudejar and Gothic (sometimes in combination), Renaissance and Baroque. Most are kept locked except early in the morning, or in the evenings from about 7 pm until 10 pm - a promising time for a church crawl, especially as they`re regularly interspersed with bars! 14th century Gothic Mudejar with later additions. There are three naves; the one on the right has a beautiful four sided chapel with a Mudejar ceiling dating from 1379. Dating from the 17th century, there are several paintings by the Sevillian painter, Zurbaran. 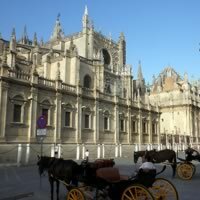 Seville has many enclosed religious complexes, but few are accessible. This is one of them, a convent set up in 1475 and still home to 40 nuns. The public is welcome to enter through two different doors in the Calle Santa Paula. Knock on the brown one, marked number 11 to look at the convent museum. Steps lead to two galleries, crammed with religious paintings and artifacts. The windows of the second look onto the nuns` cloister. The nuns make a phenomenal range of marmalades and jams which visitors may purchase in a room near the exit. Ring the bell by the brick doorway nearby to visit the convent church, reached by crossing a meditative garden. Its portal vividly combines Gothic arches, Mudejar brickwork, Renaissance medallion and ceramics by the Italian artist, Niculoso Pisano. Inside the nave has an elaborate wooden roof and there are some fine statues here of St John the Evangelist and St John the Baptist. This 14th century church retains several Mudejar features, notably its Giralda-like tower (based on the minaret of an earlier mosque) and the decoration on the Gothic portal on Plaza de San Marcos. The restoration of the interior, gutted by fire in 1936, has highlighted unique horseshoe arches in the nave. A statue of St Mark with book and quill pen, attributed to Juan de Mesa, is in the far left corner. In the plaza at the back of the church is the Convento de Santa Isabel, founded in 1490. It became a women`s prison in the 19th century. The church dates from 1609. 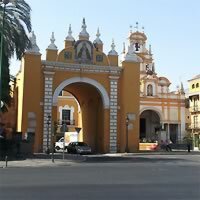 Its baroque portal, facing onto Plaza de Santa Isabel, has a bas-relief of the Visitation sculpted by Andres de Ocampo. Built on the former sight of a mosque, this 14th century church has a Mudejar tower modeled on La Giralda. Within the entrance is a surprisingly placed horseshoe arch. At the far end of the nave, the Capilla Sacramental is by Leonardo de Fugueroa while, on the right, the Capilla de la Exaltacion has a decorative ceiling which dates from around 1400. The Salvador church began construction in 1674 on the remains of Mezquita Mayor, which was the main mosque in Seville from the 9th century. Architect Esteban Garcia originally began erecting the church, but it was left to Leonardo de Figueroa to complete in 1792. The architects incorporated the Arabian mosque`s Patio de Abluciones and basement into the design, and also added sculptures from Martínez Montañés and Juan de Mena. Today the plaza in front of the church, Plaza del Salvador, provides a popular meeting place and destination for both locals and visitors alike, with its various bars offering outside tables. On the northern tier of central Seville, the Basilica de la Macarena possesses the most revered image in Seville, "The Virgin of Hope" (Nuestra Señora de la Esperanza) which locals call La Macarena. La Macarena is the patron saint of matadors and a favorite of Spanish gypsies. The Seville-born matador Joselito spent a large portion of his fortune to buy four emeralds for her statue. When he died in the ring in 1920, the Macarena dressed as a widow for a month. The statue of La Macarena is attributed to the sculptor Pedro Roldán and thought to date from the end of the 17th century. Seated in a place of honor in the basilica, the beautiful Madonna statue is dressed in magnificent robes and jewels. Five teardrops run permanently down her elegant cheeks. Each year on Good Friday, the holiest day of Semana Santa, the fraternity dedicated to La Macarena appears in procession, leading her image through the city streets in mourning for the death of her son. The basilica also houses a treasury displaying rare ecclesiastical relics.